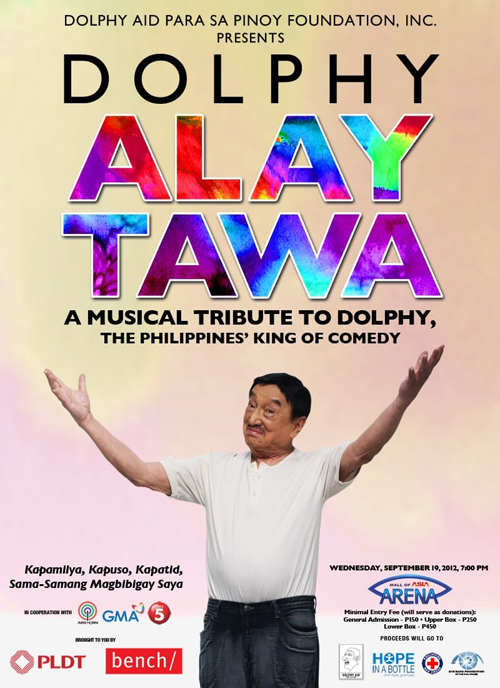 DOLPHY ALAY TAWA : a Musical Tribute to the King of Comedy scheduled on September 19, 7pm at the SM Mall of Asia Arena. The event is produced by the Dolphy Aid Para sa Pinoy Foundation in cooperation with ABS-CBN, GMA-7 and TV5. Stars from the the three networks will gather for this rare occasion to pay homage to Dolphy, whose life served all walks of life through his talent, charisma and untiring commitment to entertain people. Celebrities, regardless of network affiliation, are joining hands for this special concert, making themselves available to be able to express their appreciation for Dolphy. The event, a celebration of his life, will be led by the Quizon children, with Zsa Zsa Padilla and the following performers/artists : Vilma Santos, Nora Aunor, Vic Sotto, Sharon Cuneta, Maricel Soriano, Aga Muhlach, Ai Ai delas Alas, Judy Ann Santos, Gary Valenciano, Martin Nievera, Ogie Alcasid, Janno Gibbs, Michael V, Lorna Tolentino, Edu Manzano, Roderick Paulate, Vhong Navarro, Shaina Magdayao, Jolina Magdangal, Toni Gonzaga, Angeline Quinto, Rachel Ann Go, Luis Manzano, Ryan Agoncillo, John Prats, Mark Herras, Wally and Jose, Derek Ramsey, Ruffa Gutierrez, Wendell Ramos, Keempee de Leon, Smokey Manaloto, Jhong Hilario, Iya Villania, Ruby Rodriguez, Melai Cantiveros, The Bulilit Kids, Neil Coleta, JC de Vera, Alex Gonzaga, Danita Paner, Martin Escudero. Bottle, Philippine Red Cross and the Eyebank Foundation of the Philippines.